I asked the question above on twitter, and got many answers back. But surprisingly, all of them chose private schools. Why did they choose private over public schools? Qualifications of teachers, being taught in english, the curriculum and the fact they help in building the child’s personality. Strong points. Knowing the current standards of education offered at public schools, it would be pretty pointless to have your kids attend them. The teachers are generally either careless or incompetent. Not all but some students generated a horrible reputation for the public schools as being insufficient or chaotic in a way. Private schools sure are more “business” based, but the courses offered, the type of teachers hired, and the general education and curriculum being taught is so much more requisite. The government provides all the necessities sure, but for an environment for my kids to be in? 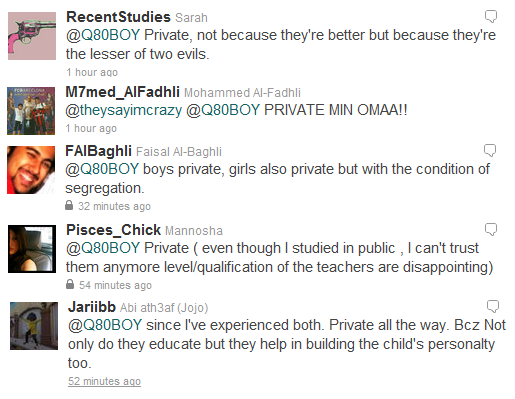 I’d definitely go for private schools. Having your kid in a private school is an investment; it pays off in the end. I prefer sending my child to a private school because I think he would get a better education. Another thing is that I’ve noticed that the way guys in a private schools think is much better than the public school guys. I asked a couple of people about their thoughts about the behaviour of the students from either private schools or public schools? Do they differ? Does it matter? According to @RecentStudies: Well, the rich kids think they’re better because they go to private schools, while 7ukooma kids sometimes feel marginalized. @QueenZee88 on the other hand said: that depends on the parents, if they raised him to behave well it doesn’t matter where he is. I agree more with @QueenZee88 .. In my opinion there are 3 main sources of education: home, school, and friends. The education you get at home determines your behavior outside your home, the education you get from school determines your academic capabilities and the education you get from friends determines your personality. I think if it’s a private school, the teachers are more accountable for their teachings and you get a better level of teaching. Also, there are more options for you and things for you to do in & out of school. That’s that .. so what do YOU guys think? Do you share the same views? Do you differ on some? Share your thoughts!! This entry was posted on Sunday, January 30th, 2011 at 9:38 pm and is filed under Away and Home. Tagged: Private schools, Public schools. You can feed this entry. You can leave a response, or trackback from your own site. I guess your survey proves private school kids are best right? I also think private international schools are better than ones where the kids are all locals, if that makes sense.